(Reuters) - Sri Lankan shares fell for a fifth straight session on Friday and closed at their lowest in nearly eight months as investors sold their stocks to settle margin trading ahead of quarter-end, while political worries also weighed on sentiment. The main stock index ended 0.71 percent, or 49.31 points, weaker at 6,873.52, its lowest close since Aug. 6 and further moving away from the key psychological support level of 7,000. It has lost 6.07 percent in the past 20 sessions. "The market fell across the board due to margin calls and month-end settlement selling pressure," said Dimantha Mathew, research manager at First Capital Equities (Pvt) Ltd.
Analysts expect the next support level at 6,800. Shares of the country's top mobile phone operator, Dialog Axiata Plc, fell 0.92 percent, while conglomerate John Keells Holdings Plc dropped 0.69 percent. Shares of the country's biggest listed lender, Commercial Bank of Ceylon Plc, fell 0.71 percent. The day's turnover was 447 million rupees ($8.28 million), less than half of this year's daily average of 1.21 billion rupees. Foreign investors sold a net 91.5 million rupees worth of shares. But they have been net buyers of 3.12 billion rupees so far this year. Analysts said concerns that the government's decision-making process would slow down, also weighed on sentiment after President Maithripala Sirisena formed a national government incorporating the main opposition party in a bid to push through reforms and preserve political stability. Former Air Force Commander and Chief of Defence Staff Roshan Gunathilake was interrogated by the Police Financial Crime Investigation Division (FCID) on the MiG aircraft transaction in 2006, Police Spokesman ASP Ruwan Gunasekara said. He said the interrogations were based on the Rs.1.5 million spent on repairing four MiG aircraft bought in 2006 from Ukraine. 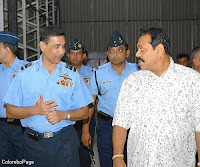 Meanwhile, former President’s Chief of Staff Gamini Senarath was again interrogated by the FCID this morning in connection with the large scale corruption alleged to have taken place at the People’s Leasing Company.